Jalapeños Muy Caliente? 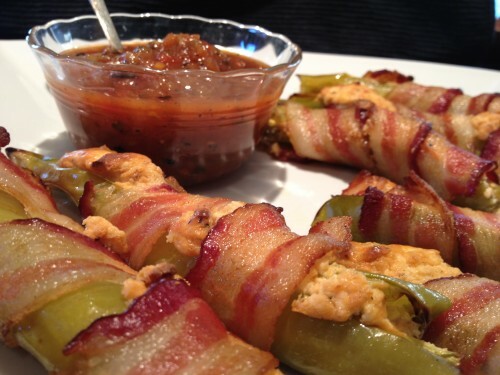 Try These Bacon Wrapped Green Chili’s! I love jalapeños, but some people find them a tad “warm”, shall we say. You know the type. One bite, and their eyes swell shut, they start sweating profusely and waving their hands in front of their mouth to put out the 5 alarm fire inside. That’s fine, they’re not for everyone. To accommodate your friends and family who would prefer something milder, try these green chili’s, or Anaheim chili’s, instead! Green chili’s have almost no heat, so they are a great option if you are looking for an appetizer that will appeal to a wider audience. Simple ingredients, and the prep time is less than 15 minutes, not including oven time. Jalapeños Too Hot? 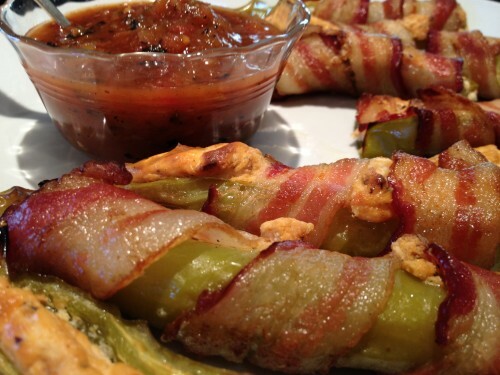 Try Bacon Wrapped Green Chili’s! In a bowl, combine cream cheese with a few heaping tablespoons of the salsa and a few heavy pinches of salt & pepper then mix well to combine then set aside. Slice the stem side of the pepper off. 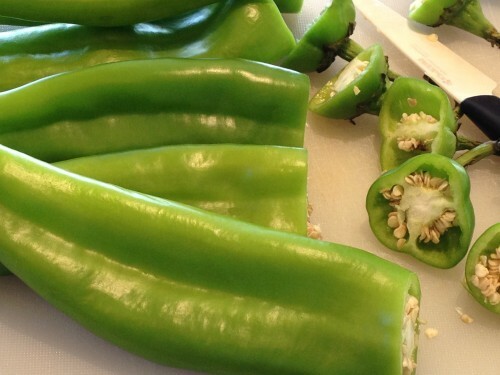 Now slice pepper in half lengthwise. Spoon out and discard the seeds and stems. 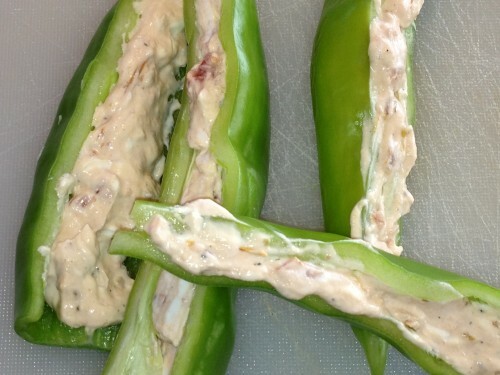 Use a piping bag or zipper bag** to spread about 2 tablespoons of cream cheese mixture in the hollowed out portion of pepper. Wrap entire pepper with strip of bacon. Place on a baking rack inside a baking pan so that the bacon fat can drain away. Bake for about 25-30 minutes or until bacon has browned. *Your bacon will cook more thoroughly if you buy the regular bacon rather than the thick slices. 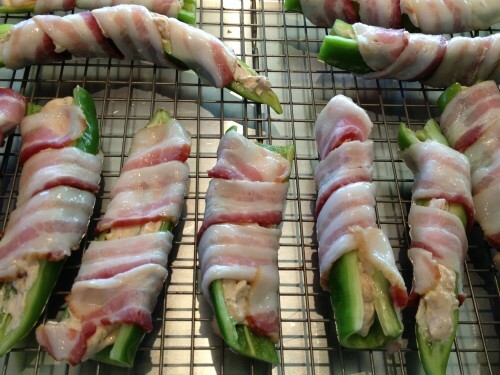 Also, allow bacon to sit out of the fridge for about 15-20 minutes so it will be easier to stretch around the pepper. ** Put cream cheese mixture in a plastic zipper bag and snip off a small corner with scissors then “pipe” the cream cheese into the chili. Slice the stem side of the pepper off. Cut the chili’s lengthwise to create two chili “canoes”, scrape out the seeds and pipe in the cream cheese/salsa mixture. 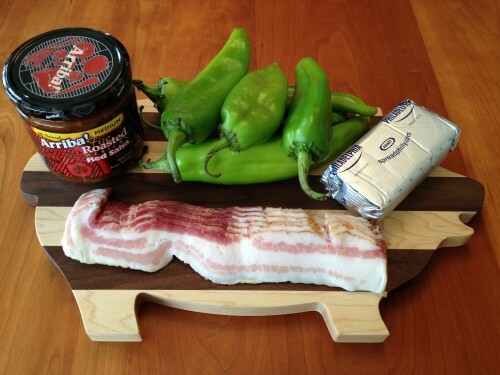 Wrap the chili’s with bacon, and place on a cooking rack inside a baker’s half sheet. Bake in the oven at 425 degrees for 25 – 35 minutes, depending on the thickness of the bacon. Serve with salsa, and you’re ready to go! Tasty! And no trips to the ER for your pepper challenged friends and family! It’s late August, and most of you have probably endured a brutally hot summer. I thought we would take a trip into the future where it’s cooler, so imagine the changing of the season…the days getting shorter, the leaves starting to turn, the air getting crisp. The Fall Equinox is time for heartier fare, and this side dish is so right for the season. 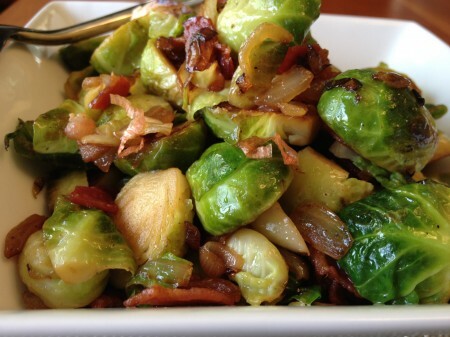 The taste characteristics work really well together — the sweet caramelized onion and shallot, the salty bacon and the slightly bitter sprouts combine to create an amazing medley of flavor. There are countless meal combinations that entice…grilled chicken breast (on the bone, of course), roast turkey (Thanksgiving, anyone? ), grilled pork tenderloin (drizzled with a balsamic reduction), prime rib (Ho! Ho! Ho! 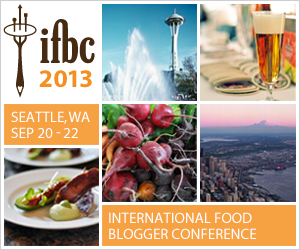 ), lamb….the possibilities are limitless! Bring large pot of water to boil. 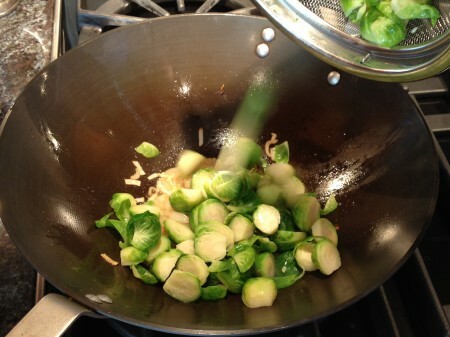 Add Brussels sprouts to water and cook until just tender, 4-6 minutes. Drain and set aside. 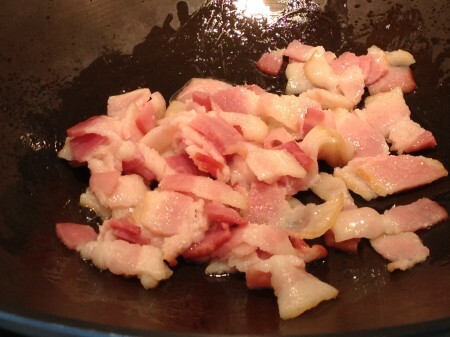 In wok over medium heat, add sliced bacon, stirring until brown but not yet crisp (5-6 minutes). Remove with slotted spoon and drain on paper towel. Discard all but 1 tablespoon of bacon fat. Add EVOO to the reserved bacon fat and heat over medium heat. Add onion and shallot, stirring often until soft, but not browned. Season with salt and pepper, and add Brussels sprouts, now over medium-high heat. 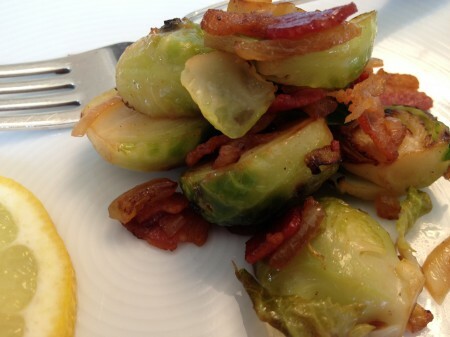 Toss or stir occasionally, until the Brussels sprouts are tender and warmed through — about 5 minutes. Add lemon juice, toss or stir. Add bacon, toss or stir. Served up with a juicy grilled pork tenderloin, mashed potatoes and a nice Oregon Pinot Noir — now we’re talking! 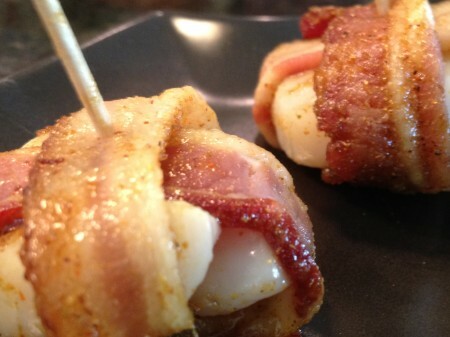 Sea Scallops with Spicy Bacon! Smoked on the Grill! Bacon and scallops always pair beautifully. 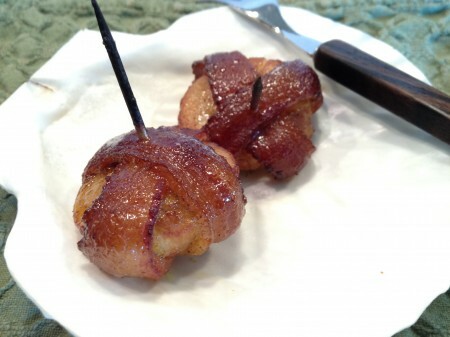 In this recipe orchestrated by The Bacon Hunter’s midwest correspondent, “Bajan D”, it is the mixture of sugar and spice that transforms these easy-to-make hors d’oeuvres into something very special. Finished over charcoal and cherry wood for a sensuous, tasty treat and paired with an amazing Spanish Cava…Wow! Easy to make — you must give this one a go! Fire up charcoal grill, coals placed in barbecue for direct heat. Stir together brown sugar, curry powder, and cayenne in a bowl until combined well. Cook bacon in a heavy skillet over moderate heat until some fat has rendered and edges begin to brown but bacon is still flexible, about 2 minutes. Transfer bacon to paper towels to drain and cool. Cut bacon slices in half lengthwise and then crosswise, so you have 20 small strips. 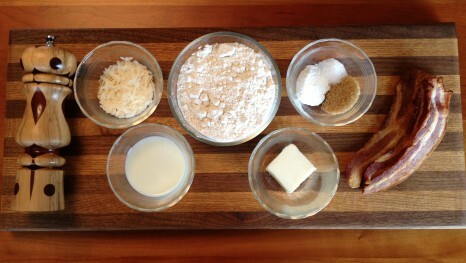 Divide sugar mixture among slices, spreading evenly on bacon slices and lightly pressing to help it adhere. 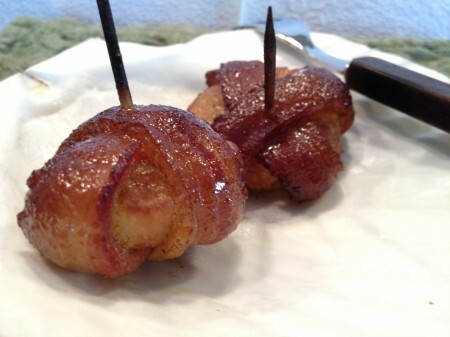 Place 1 scallop half, cut side down, on a slice of sugar-coated bacon, then wrap bacon around scallop. Repeat in cross pattern and secure with a toothpick. Transfer to lightly oiled BBQ rack. When coals are hot, add cherry wood chips and allow chips to ignite before placing BBQ rack directly on grill. Close barbecue lid and smoke until bacon is browned and scallops are opaque, about 6 minutes total. 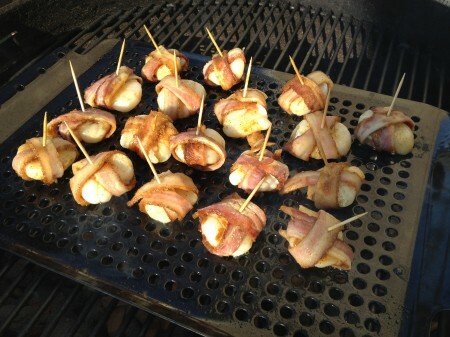 Pre-cooked bacon wrapped scallop ready for its closeup! It ain’t nothing but a grill party! 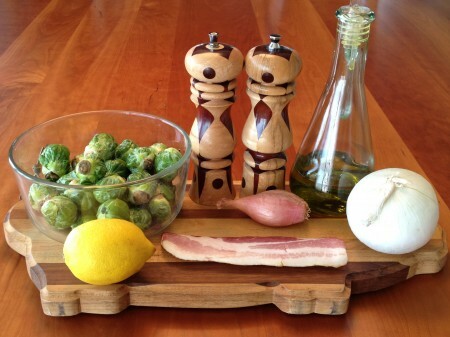 The cherry wood adds a very mild smoke flavor, and allows the spicy bacon to shine. Check out those browned scallops — so good! Just watch your grill time closely so the scallops don’t over cook. Serve with champagne, sparkling wine or a nice sauvignon blanc, throw in a foreign accent, and your friends and family will swear you’re Wolfgang Puck! 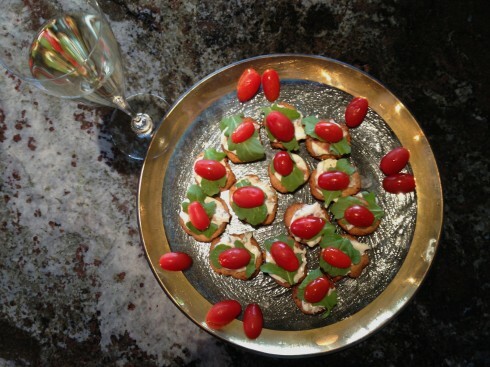 These bite-size BLT appetizers are awesome! An open face version of my favorite sandwich, these little guys consist of a crunchy bacon and Parmigiano cheese cracker that’s topped with a tangy mayonnaise spread, a chunk of bacon, a single arugula leaf and half of a cherry tomato. 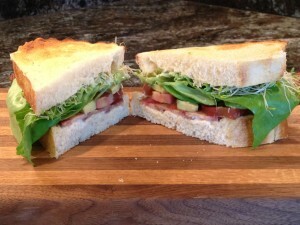 They are easy to make, and they really do taste just like a BLT! 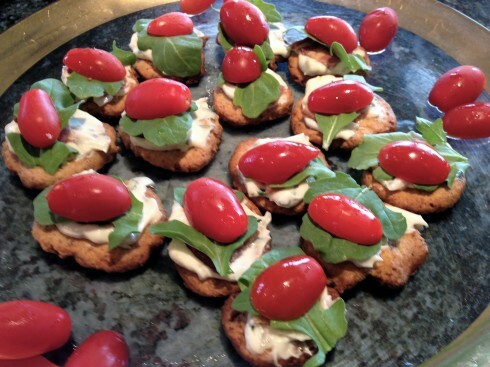 Be forewarned: If you make these for a party, make plenty… my personal experience has shown that these mini BLT’s will channel David Copperfield and disappear right before your very eyes! Combine flour, Parmigiano-Reggiano cheese, sugar, baking powder, sea salt, and a generous pinch of black pepper in a food processor. Pulse once or twice, add bacon, and process until bacon is finely chopped. Add the milk, bacon fat or butter, and process until mixture pulls together. Remove the dough and roll into a log about 1¼ inches in diameter. Wrap in plastic and chill for 30 minutes. Slice dough crosswise into just under ¼-inch-thick slices and bake on a cookie sheet for 30 minutes. Remove and cool. In a small bowl, blend the mayonnaise, parsley, shallots and sage. Spread the mixture on the crackers. Add the bacon, arugula and tomato halves, cut-side down, and serve. 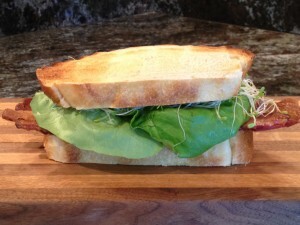 I love a good Bacon, Lettuce and Tomato sandwich. 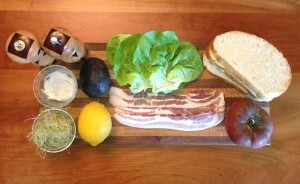 The beauty in that statement is there are no bad BLT’s, so picking a favorite becomes a life long pleasure. One look at the photo above and you will understand why this one is my current choice. Now you are ready to enjoy a savory masterpiece! The toasted sourdough bread sets a delicious stage, and the mayo with the lemon juice really adds a nice, subtle kick. The pleasantly sweet and salty/smoky applewood bacon is obviously the dominant player here. The heirloom tomato and avocado slices contribute richness, and the butter lettuce and the sprouts bring interesting textures and wonderful flavors of their own. Delicious!